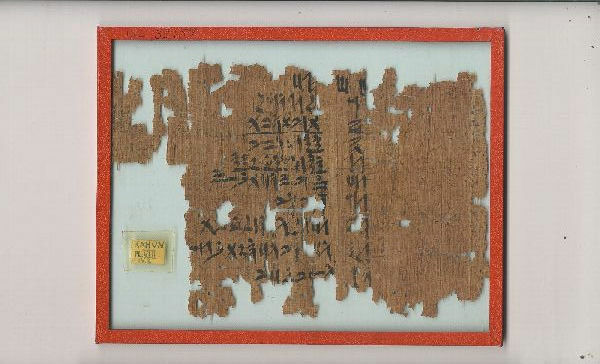 This fragment contains a part of the best known Egyptian table text, the 2:n table. The 2:n table was used for fraction reckoning. Egyptian fraction reckoning used only unit fractions. Fractions that have, in our modern notation, a numerator bigger than one were expressed as sums of different unit fractions. The 2:n table gives sums of unit fractions for the result of the division 2:n (2 divided by n), with odd n. Its most extensive version extant can be found in the Rhind mathematical papyrus, which shows the table for the odd numbers n=3 up to n=101. The fragment UC 32159 shows the table for the odd numbers n=3 to n=21. The sum of unit fractions given are exactly the same as in the Rhind papyrus. This supports the conclusion that although for every n there are several possible representations of 2:n as a sum of unit fractions, the Egyptians used only one of them. The table displays in the first column (columns are not written as such) the divisor n (in the first row it shows both dividend 2 and divisor 3). This is followed by a second column that alternatingly shows fractions of the divisor and their value (as a series of unit fractions). The second line, for example, starts with the divisor 5, it is 2:5 that has to be expressed as unit fractions. This is followed by 1/3 and 1 2/3 (that is 1/3 of 5 is 1 2/3 ) and by 1/15 and 1/3 (1/15 of 5 is 1/3 ). Since 1 2/3 and 1/3 add up to 2, the series of unit fractions to represent 2:5 is 1/3 1/15 . There have been several attempts to explain the choice represented by the Egyptian table, however those are guided by modern mathematical principles and do not explain choices that rely on Egyptian techniques.